In countries such as France and Belgium, you are just as likely to see mayonnaise used as a salad dressing as the traditional oil and vinegar mixes. You'll also find liberal quantities in use any time they eat 'pommes frites'! Making your own Mayo is easy and it keeps for up to a week in the fridge. Some though are still concerned about using fresh, uncooked eggs, but today in Europe, over 90% of supermarket eggs come from chickens which have been vaccinated against salmonella. But organic is best. In the US, this is not always the case - unless you have farm eggs - so in the immortal words of Benny Hill; "pasteurised is best". Getting egg and oil to form a balanced, creamy and above all stable emulsion, is easy as long as you take a bit of time. You can whip it up by hand; first the eggs, then adding a little vinegar and mustard and finally the oil, going in drop by drop initially. Or you can use a hand blender in the same way for the fail-safe and quickest approach. - 250 ml of extra virgin olive oil, organic rapeseed oil or a mix of your favourites (using only olive oil can be a bit intense in taste but blending in some avocado or macadamia nut oil adds flavour). And… if it separates? Just put an egg yolk in another bowl and whip your ‘failed’ mayonnaise gently onto it. No problems. To personalize, add a clove of crushed garlic or some freshly minced herbs herbs, and for a thinner version as a salad dressing, just whisk in a little water or yogurt. 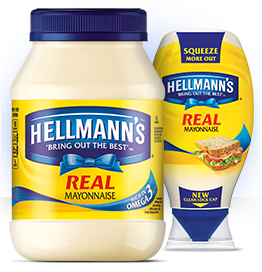 This mayo is gluten free, low-carb and lactose free! It is easier and quicker to form an emulsion of the right consistency if you just use the egg yolks. Calcium Disodium EDTA in Hellmann's? Ethylenediaminetetraacetic acid, known as EDTA, is a chemical salt used to separate heavy metals from dyes and other substances. One form, calcium disodium EDTA, appears in foods and cosmetic products to prevent air from spoiling them by introducing unwanted oxygen into the products' molecular structures. Calcium disodium EDTA is toxic to humans in high amounts. In manufacturing, EDTA is used in calcium and sodium compounds to improve stability in pharmaceutical products, detergents, liquid soaps, shampoos, agricultural chemical sprays, oil emulsion devices, contact lens cleaners and cosmetics. It is also used in certain blood collection tubes used by medical laboratories. INGREDIENTS: SOYBEAN OIL, WATER, WHOLE EGGS AND EGG YOLKS, VINEGAR, SALT, SUGAR, LEMON JUICE, CALCIUM DISODIUM EDTA (USED TO PROTECT QUALITY), NATURAL FLAVORS. Perhaps the real question should be; how do shop bought brands have a shelf life once opened of many months when in the fridge? Corn starch and sugar help thicken and sweeten them (adding carbs) but just check the ingredients and you are sure to find different stabilisers and preservatives; notably additional gum-based emulsifiers which extend life. This is ironic considering eggs are the original emulsifiers - that's how mayonnaise is created out of oil.